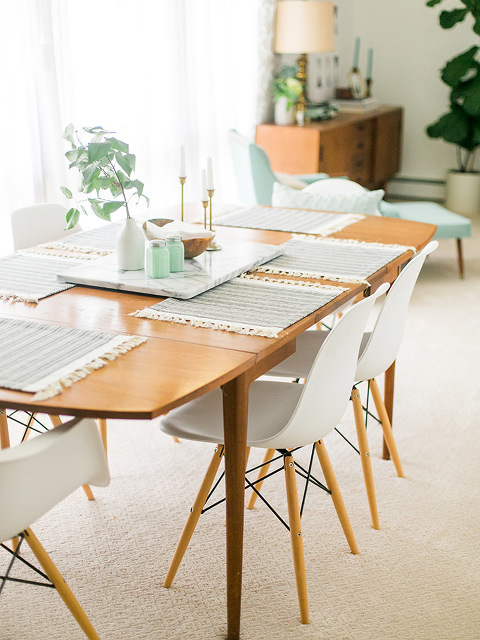 Today I’m continuing my room-by-room tour of our house with a peek at our dining room (in case you missed them, see our family room here, and the kitchen here). This room was at the top of my wish list of items while we were house hunting because, up until this point, I had never enjoyed a formal dining room of my own. Our townhouse had an eat-in style dining room, which left me wanting a little more privacy and, of course, less of a direct sightline into the often-messy kitchen. While our new-to-us dining room is admittedly open to the living room, there’s a big old wall separating it from our kitchen. 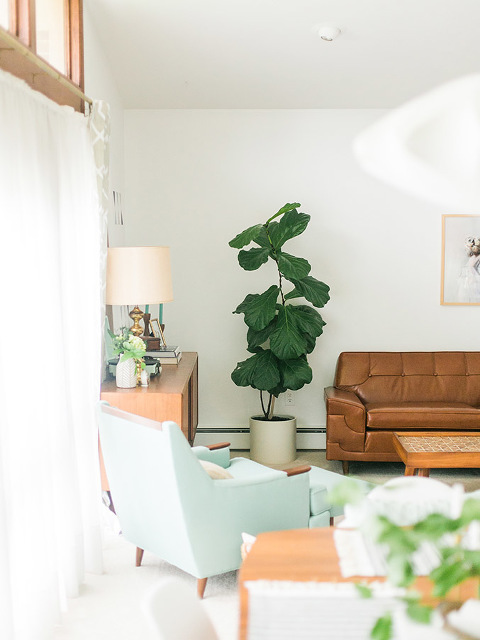 I don’t mind one bit being able to gaze into the living room since that space is always tidy and put-together (no dirty dishes, ugly appliances, or mid-prep ingredients to be seen). I’ll be sharing a lot more about the living room in its own post, but the room doesn’t even have a TV—instead it’s intended just for conversation and hanging out—so it’s a nice complement to our equally formal dining room. The wall you see pictured here in this post with the large scale Paris photograph is the one that backs up to the kitchen. The wall opens up on end to allow good flow into the dining room, and there’s a large triangle shaped cut out at the top of the wall to allow light into the kitchen on the other side (you can see what I mean a little better in this post from when we had just moved in). If you scroll up a few photos above to the picture of me placing plates on the table, you’ll spot the opening into the kitchen as well as our main entry door, the one that leads in from our side carport. The collection of these three rooms—the dining room, the living room, and the kitchen—serve as the hub of our home, and is where we (pets included) spend most of our morning and early afternoon hours. So you don’t get too confused, the door you see just over my shoulder two photos up is the side door on the opposite side of the house that leads into the sunroom. I think my very favorite thing about living in an A-frame home is that we get to enjoy all of that blissful natural light. Our dining room is right at the front of the house, which allows it to take full advantage of the bank of floor-to-ceiling windows. The sun curves from one end of the windows up and over to the other side every single day, making it not unusual for the front rooms to look bright even on cloudy days. The A-frame architecture of our 1960s ranch also gives these two front rooms ample headroom thanks to a peaked ceiling. Someday I would really, really love to add beams and white paneling to the ceiling to accentuate it a little more (like this), but for now, we’ll just enjoy the sweeping smooth white walls. As for furniture in the space, it didn’t need much. We have a dining set, a china hutch, a small basket for shoes (since the dining room acts as an entryway for that side carport door), and a floor globe that I picked up from an antique store. 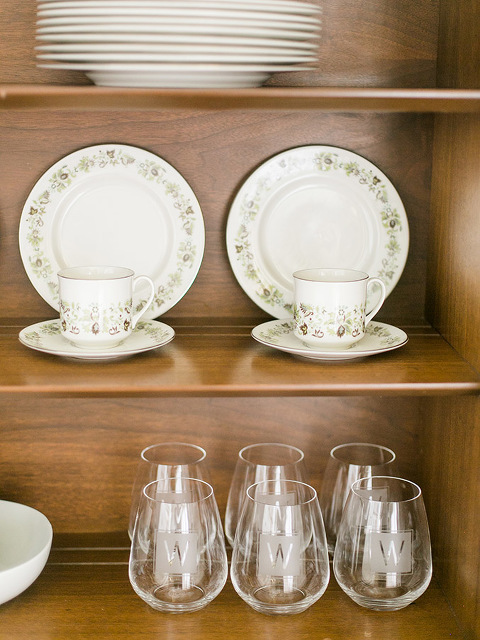 Speaking of sources, the room plays host to a combination of vintage mid-century antiques and retro reproductions, a methodology that you’ll find all over our house. Right now, I’ve got my heart set on replacing our reproduction white dining room chairs with authentic wooden ones from the early 1960s, but I haven’t found quite the right set just yet. One suggestion I hear often is that we should consider taking down that wall separating the dining room from the kitchen (again, the one you see above to the left behind the big framed photograph), or to add a cut out opening. Yes, this would give our dark kitchen added light, but I just softly smile and nod whenever anyone says this to me. 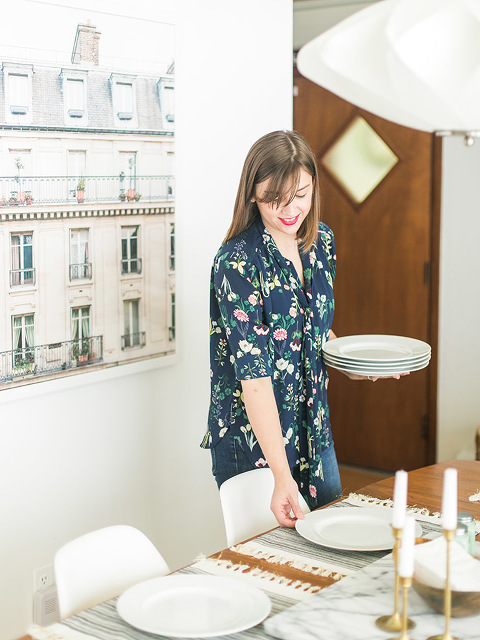 Our dining room is absolutely perfect for us just the way it is—wall and all. That might not be true for another family, but I adore the fact that the wall allows me to call this dining room “formal” and wouldn’t have it any other way. Who knows what we’ll do in the future, but for now that full wall is here to stay! Scroll on for a full list of linked resources for this room, and let me know in the comments if you have any questions or suggestions. I’d love to hear your take on how far we’ve come—see how it looked on move-in day here!